On a hot Seattle day there's nothing I appreciate more than a breezy, cotton tee or tank top. In particular, I am loving the bold graphic trends that are popular this year. It's a great go-to when you want to stay cool but also make a statement. For this collaboration Graphic x3 with Seattle-based photographer KNDM Co and her sister Amanda Dishman, I am demonstrating how to wear three different types of graphic tops with a combination of various accessories all while wearing the same pleather shorts from H&M, to show how each top can make a different in each outfit. 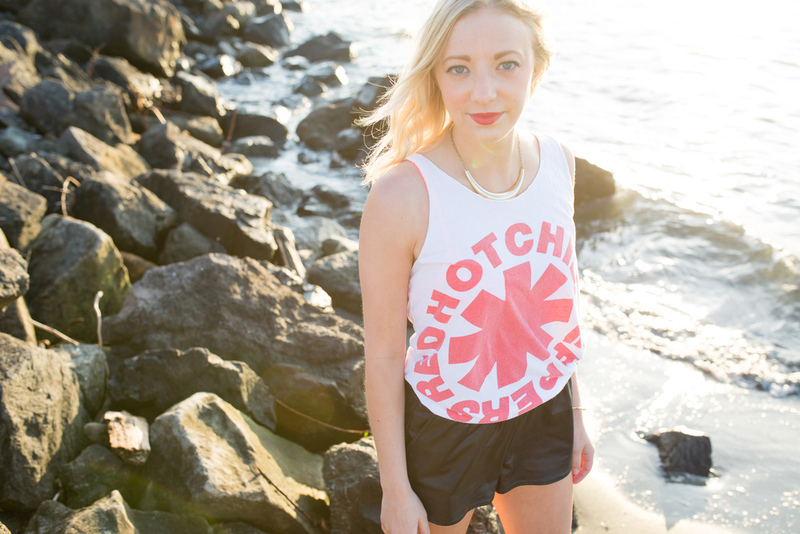 In my second look of the series, I'm wearing what has become a weekly summer staple: my Red Hot Chilli Peppers tank top. Summer is a great time to wear tops with witty sayings and stand out graphics but in particular, it's a time of year when you can get away with rocking all of the band tees that are hiding in your closet. What I love about this top is the larger fit, making the top flexible for tucking into a pair of shorts or pants. In this case, I have chosen to tie up the top a bit in the front and tuck it into my pleather shorts as a more relaxed look. To add a little edge, I am wearing my gold skull cuff from Urban Outfitters and a dainty gold cuff from Franchesca's. Dainty jewelry is the key to success in the summer because it doesn't get in the way but still ties an overall outfit together. Because this look is so casual for the beach, I am sporting a basic black ball cap from Target in some of these shots as a great way to show off a classic staple that can still look on trend when at the beach. Although this outfit could look great with a pair of high top converse or Nike Frees, when playing on the beach in the sand, you can't go wrong with a pair of slip on sandals. My black beaded Sam Edelman sandals are what I'm sporting in this look, they are stylish and comfortable -- the key to success for beach days.